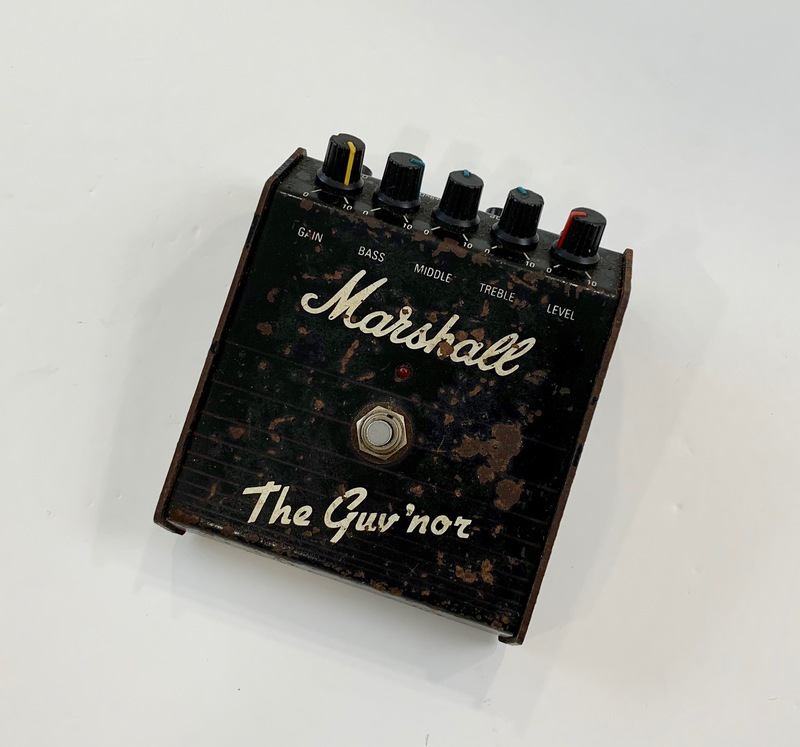 The Guv'nor, Distortion from Marshall in the Effects series. Marshall is pretty well-known for their hard rock amplifiers but they're not as well-known for their pedals. They do make some decent sounding pedals to give you basically the sound of a Marshall amplifiers but not really the feel of a an all tube amplifier. The Marshall governor pedal is a cool little pedal to get you that hard rock plexi or JCM 800 type tones. Basically this is a pedal that will emulate the sound that you would get out of the Marshall amplifier that you have ever seen or heard. This pedal pretty much has everything you would see on a normal amplifier that they would have other than the presents control knob. You have the gain, bass, middle, trebel, and level control knobs. This is basically everything you would see on a normal amplifier. Therefore you are getting the amplifier voicing in a small little pedal. 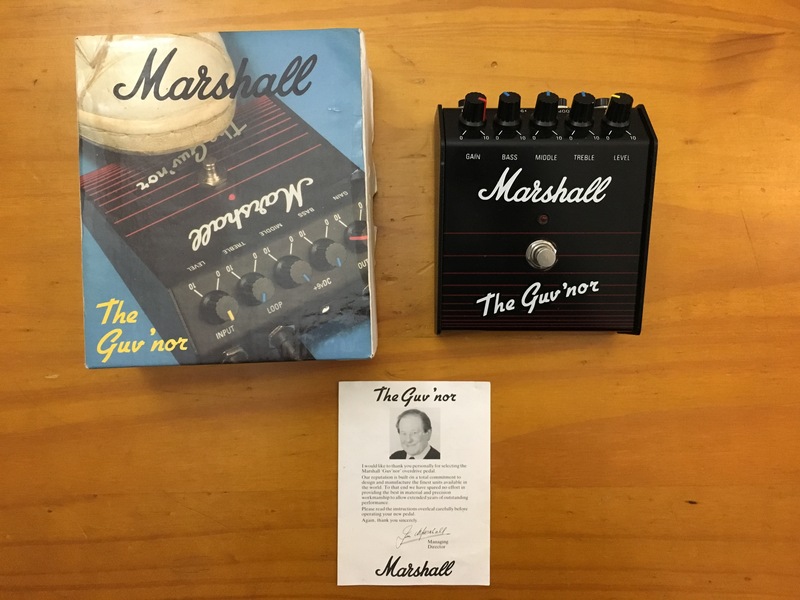 This is basically the first introduction that Marshall had and since then they have re-issued the governor pedal or at least updated the pedal with a new look in a smaller case. So if you're looking for a nice Marshall type sound out of the pedal than this is the pedal you would probably grab. They have since discontinued this pedal for quite some time now but they have a newer version of this exact same pedal with a few more newer modern features. It's a pretty inexpensive pedal so if you looking to get this paedal I would suggest bypassing it and going straight to the newer version with more options. This is a distortion/overdrive pedal made by Marshall. It's not rackable, nor can it be edited through a computer program. It's pure analog distortion that connects via the 1/4' instrument cable. The pedal, like most distortion pedals, is pretty simple to use. It has Volume, Gain, and three way EQ knobs on it, and the main switch activates/bypasses the effect. Messing around with the tones to adjust to your rig is quite easy, its nothing a seasoned player hasn't seen before, and it's also nothing a newcomer couldn't figure out pretty easily. I have never opened a manual for this pedal, as I had no need, really. I used this pedal with a Fender Twin Amp and a Fender Strat with single-coil pickups. I have a remarkably bright-sounding guitar, so I don't know if it's the pedal or the guitar, but for some reason this pedal didn't do it for me. After playing through a real Marshall amp, which this pedal is supposed to recreate, I was hoping to get a good approximation of the Marshall sound, as well as the benefits of playing through the twin. What I got, however, was a sort of thin-sounding replication, not entirely accurate. I feel as though I couldn't get the same gut-level response from the pedal is I could with a real Marshall stack or even a smaller combo. In fact, I feel as though I got a far more powerful response from turning up the preamp volume on the Twin and bypassing the pedal entirely. At least it felt more physical and heavy than the pedal. There's a possibility that a different guitar, even a different Strat, would have better results, but I'm not convinced. Even an Ibanez Tube screamer has far greater effect for me than this pedal did. I like the simplicity of the use, as well as the look of the pedal, but at the end of the day, sound is all that matters. This pedal just didn't deliver for me. Needless to say I didn't hang onto it for very long. Some people might be looking for a little less drive than I was, and could maybe enjoy it, however it wasn't for me. I wouldn't be surprised if somebody did enjoy it, but would never recommend it personally. The Marshall Guv’nor is a distortion/overdrive pedal brought to you by the makers of the classic amplifiers. This pedal is aimed to recreate the distortion sound found on Marshall amps and while it is pretty basic in make up, I think it does a pretty good job of doing that. Let me say that I will always prefer the distortion sound on a real amp over the sound of a pedal and I don’t think it is possible to replace a real amp’s distortion. 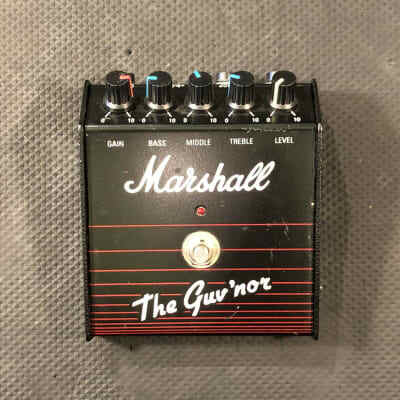 The Marshall Guv’nor has ¼ inch connections and is not rack mountable. 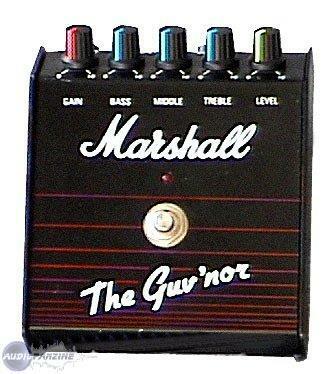 The Marshall Guv’nor is a really easy pedal to use at it simply has five knobs to control your tone. It has knobs for gain, bass, middle, treble, and level, which is pretty much the same parameters that you would find on a real amp. If you have any experience with distortion pedals or guitar amps, you won’t have any problems whatsoever with this guitar pedal. 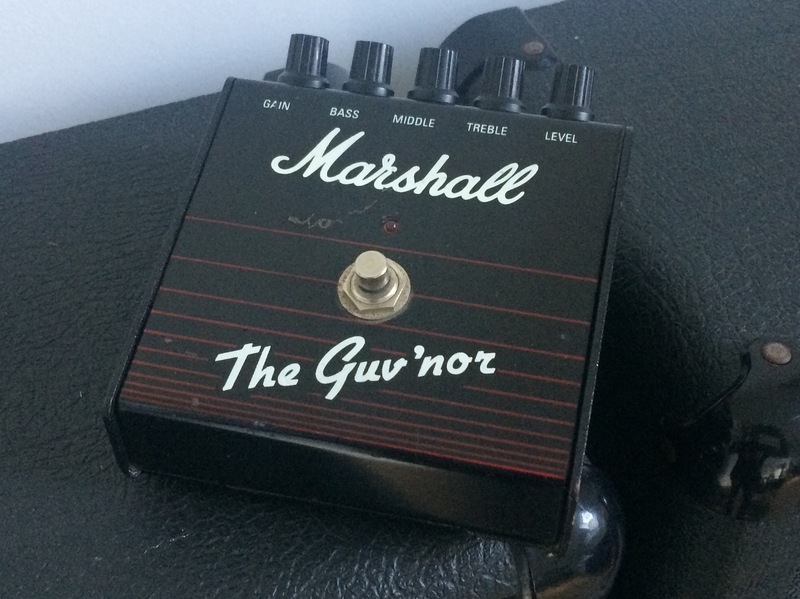 I’ve never seen the manual for the Marshall Guv’nor so I can’t speak to how helpful it is, but the pedal is quite easy to use and the manual really isn’t necessary. The sound quality of the Marshall Guv’nor is pretty good overall, but like I said earlier it is not a replacement for the real distortion on a Marshall amp. It is a nice substitution if it is not possible to have a real Marshall stack, but lacks the depth and crunch that is found on a real amp. If you are looking for a Marshall sound in a box, this is about as close as you can get but its still not there. Don’t get me wrong, this is a very good sounding distortion pedal it just isn’t a Marshall stack in a box. I’ve been using the Marshall Guv’nor for about three or four years and have come to use it in a variety of situations. While I don’t use it too often for recording as I will always try to use a real amp, this is a perfect pedal for the stage especially if you are looking for a heavier distortion sound than your Fender amp has like I am. The price is pretty reasonable making it a good pedal for players of all types and in all price ranges. 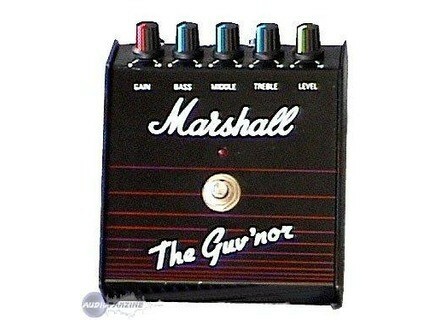 Overall, the Marshall Guv’nor is a great pedal and is great for those of us who don’t have a real Marshall guitar amp. 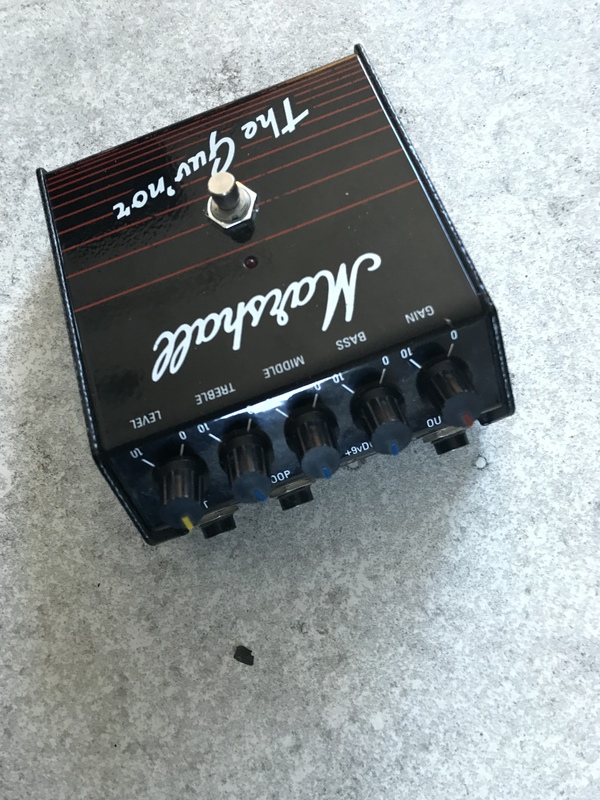 IoanQ's review (This content has been automatically translated from French)" it was helping my peps transistors ..."
I had a fender transistor, a Roland GP8 I needed a distortion. A very good sound easy, it is not good lamps either, but on a 4x12 ca defends not bad!